Is this the face of the buzziest Green Lantern? 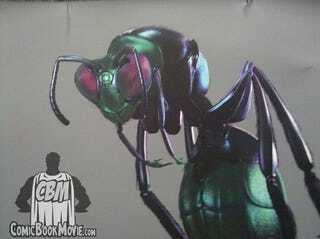 Here's concept art of Bzzd, the small insectoid Green Lantern whose tiny size belied his massive willpower. In the comics, Bzzd was partnered with Mogo, the sentient planet. Hopefully their team-up will make it to the movie intact. Comic Book Movie has posted this illustration of Bzzd, who's apparently GL director's Martin Campbell favorite Green Lantern. The inclusion of such an obscure Lantern as Bzzd hopefully means that we'll see some of the stranger Lanterns in the film. Let's hear it for F-Sharp Bell and Dkrtzy RRR!